Hello wine lovers and happy wine Wednesday! I hope it has been a great week for you. It was our daughters 3rd birthday on September 12th and I keep marvelling at how fascinating she is – I do feel blessed to have her…She wants to be a ballerina and some days a doctor – not a bad combo! 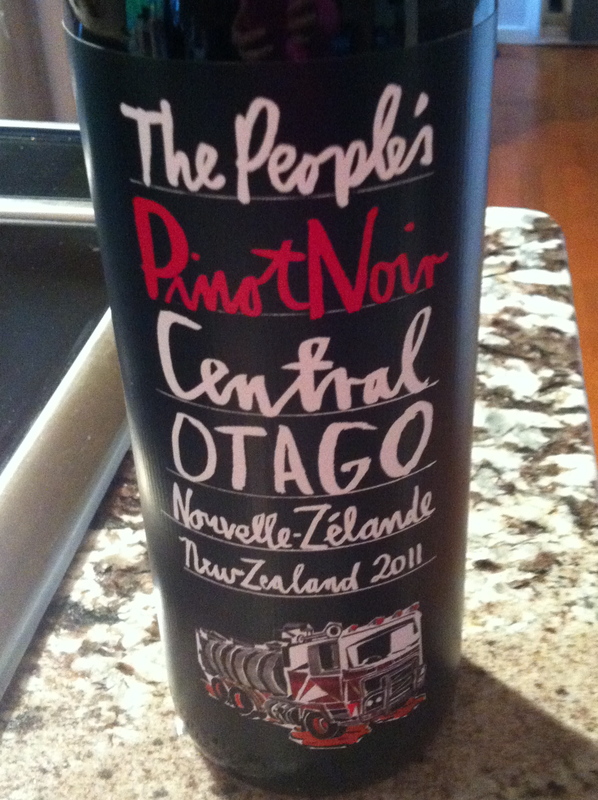 On to the wine selection of the week – The People’s Pinot Noir 2011 from New Zealand. I have to admit it, here and now, I was attracted to the label. I hear from my readers and friends more often than not – an attractive label is how they choose a wine and I guess I am in the club now too. This Pinot Noir is pale, ruby-red in colour with some developing aromas of savoury, and mushroom along with a mild vanilla spice and red and black cherry. On the palate – “The People’s” Pinot Noir is medium acidity, medium minus body and medium in alcohol. It has medium tannins that I found quite ‘rough’ and out of balance with a medium flavour intensity. There are flavours of some red fruit, a hint of a savoury note, some dried herbal flavours and a bit of spice. This is definitely not a favourite of mine. I found this Pinot Noir lacking in balance and complexity yet it was trying to be ‘all that AND a bag of chips’. It smells better than it tastes and it looks pretty on the outside with a very bold label. Darn – I was sucked in. It doesn’t rank as low as ‘Strongly Dislike’ so I will put it in the ‘In The Mood’ category if you want to spend under $20 on a Pinot Noir from New Zealand. Well – that was a disappointment after last week’s review out of Italy. Oh well – they can’t always be “Hell Yes” reviews or you would begin to wonder about me, wouldn’t you? This isn’t a bad Pinot Noir – I just didn’t really enjoy my experience with it. Truthfully – good and great wines are wines that you enjoy the taste of – quite simple. I had high hopes for this as it can be daunting to find a well-priced Pinot Noir. At $17.99 in the B.C. Liquor Stores, it is a definite ‘In The Mood’ option for you. Not a GGG favourite – a bit out of balance and lacking for me. $17.99 is not a bad price for a New Zealand Pinot Noir. Pair with Turkey Burgers on the BBQ. Side note – I tried a glass the next day and it had opened up – so let this baby breathe if you are going to take the plunge! Let’s hope for a better review next Wednesday! Hi Christine–thanks for the heads up on this wine! I am definitely an “if the label’s cool I’m intrigued” kind of girl. One pinot noir that caught me with their label was Cono Sur from Chile (there’s a charming bicycle on the label). It’s delish!! It’s my go-to red and at only 14 or 15.99 at BCL, it’s a total steal! Great feedback – thank you. Yes Cono Sur has a great value Pinot Noir! Is one of my great for the $ picks too!